There are children who struggle to learn due to undetected vision problems. 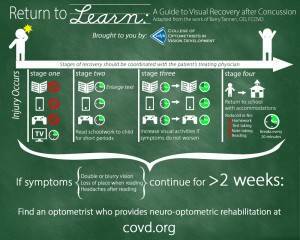 80% of Learning happens through the Visual System. 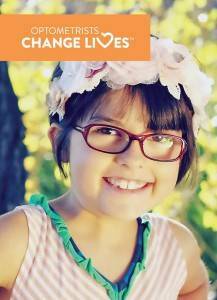 18 million children in American have not had an eye examination before entering school. 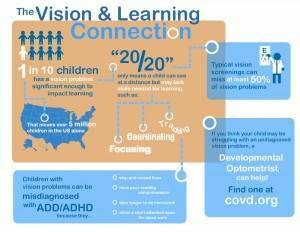 — One out of four children has an undiagnosed vision problem. — 70% of children with a learning disability in reading have some form of visual impairment, such as ocular motor, perceptual, or binocular dysfunction. •— Children with impaired vision have greater difficulty learning, playing sports, limited possibilities for employment, increased morbidity or mortality due to accidents, and difficulty with psychosocial development. The panq was going to blay in the qark. Bodqy’s father blayep the prum in the qanb. When the danb started to dlay, it pibn’t sounp goop. The qrum was off the deat. The danp stoqbed dlaying. Then Bopdy’s father lookep bown detween the qrums. There was Bodqy with a dig sqoon helding his father dlay the prums! — Tracking – the ability to follow a moving object. — Fixation – the ability to locate an object. — Focus – Ability to see clearly. — Depth Perception – ability to judge distance. — Binocularity – the ability to use both eyes together and to fuse the information into one perception. — Visualization – The ability to form mental image. The eyes are jumping over words. The eyes are jumping over lines of print. Eye fatigue and frustration are avoided when not reading. This is a clever adaptation. When words are skipped, the text does not make sense. — A skilled observer can spot signs indicating that a child may have a visual problem. — Your job is not to diagnose, but to know when to suggest a complete optometric examination. Note – This doesn’t mean just a health check and glasses check! Not all examinations are the same! ¡ For example, some doctors do not see a child until they are dilated. These medications paralyze the focusing muscle and prevent testing of near vision skills. A child may not be ready for the visual demands of the grade. Development may be enhanced with optometric treatment and activities, but will still progress through normal stages. — Strabismus is a severe problem of two-eyed coordination in which the two eyes do not line up. They point in different directions and do not work together normally at least part of the time. What would you do if you had a Vision Problem? 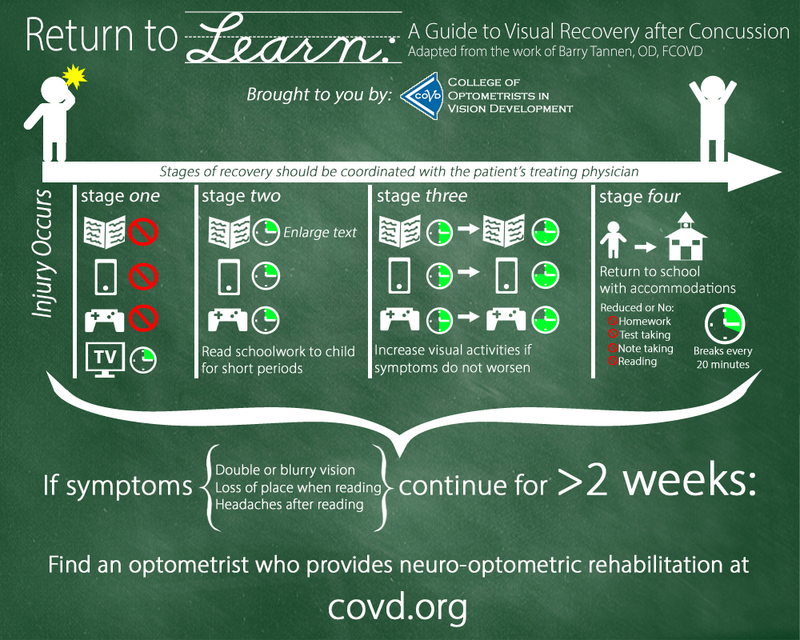 Identification and treatment of visual problems is a continuing goal for doctors of optometry. Part of every optometrist’s training in all colleges of optometry is the treatment of visual problems by procedures called “orthoptics” or “vision therapy”. — Vision therapy is like physical therapy for the eyes and brain. We see with our brains and minds, not just our eyes. — Vision Therapy is that part of optometric care devoted to developing, improving, and enhancing people’s visual performance. — Vision therapy involves medically supervised programs of therapeutic procedures and the use of medically regulated devices, such as lenses and prisms. 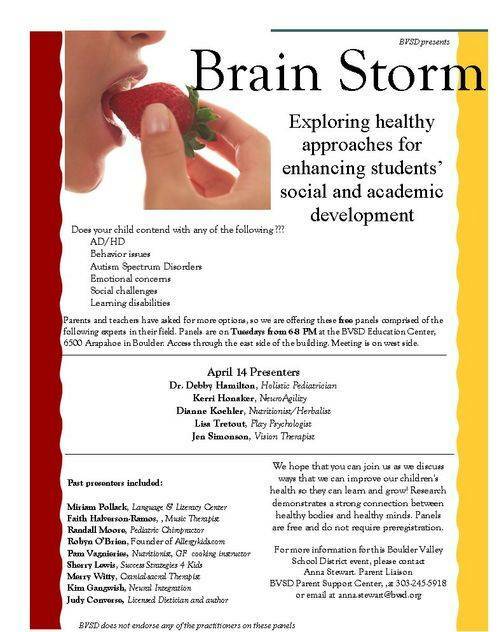 An inefficient visual system may contribute to inattention, reduced classroom performance, and learning problems. Ciuffreda, Kenneth J. The Scientific Basis for and Efficacy of Optometric Vision Therapy in Nonstrabismic Accommodative and Vergence Disorders. Optometry 2002; 73:735-62.
Cooper J, Burns C, Cotter S, et. al. Optometric Clinical Guideline: Care of the Patient With Accommodative or Vergence Dysfunction. American Optometry Association 1998.